From the When Life Gives You Lemons… Series. 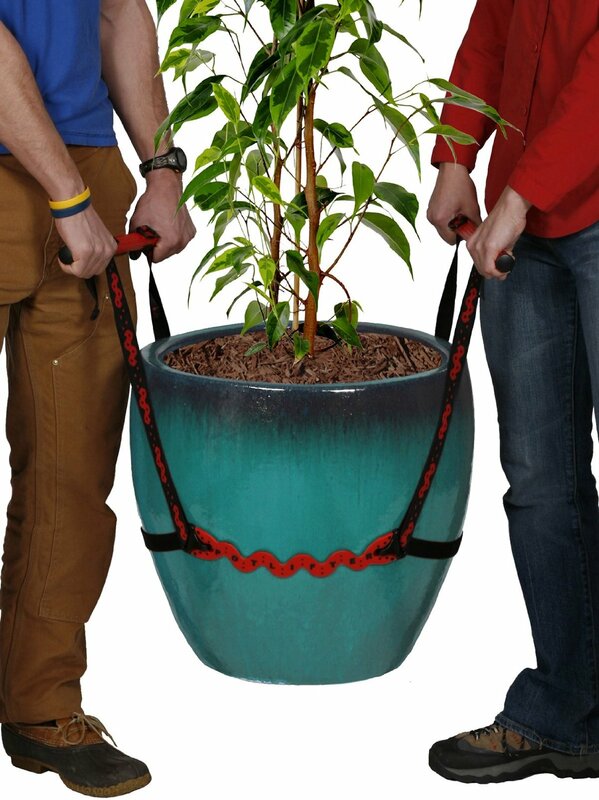 or How to Move Your Impossibly Heavy Lemon Tree. So, one of my biggest challenges is how to move my potted lemon tree into the garage when it starts to cool down. My patient hubby tends to lose patience when I ask him to move it as it is awkward and heavy and no fun. And then he starts to procrastinate ‘coz he doesn’t really want to do it, which in turn makes me anxious about the coming frost and whether my lemon will survive another night outside…. And it all turns in to a big mess. This year I had had enough of dependency and I decided to figure out a way to do it myself. Or at least with only the help of my 9 and 6 year old minions. Long I searched for practical solutions. We already had some furniture movers, just planks on wheels really, which made moving the pots over long, smooth, distances a breeze, but the pots get placed in to a garden bed each year and must be lifted over a ledge to get them in and out each time. How to lift an incredibly heavy pot without some serious braun to help? But then I came across potlifters. Have you heard of these things? This one is from Amazon and costs about $30. Looks easy to lift such a heavy pot, right? Eureka! A solution. I totally would have raced out and bought one but there weren’t any locally, only online. So I hemmed and hawed trying to judge shipping time vs impending frost, whether it would actually work given the short stature of my participating minion, and frankly, I didn’t really want to spend an extra $30 for something that might or might not work and that I would only use twice a year. Hmmm … maybe there was another way. And you know what I found? An Instructable (such an amazing resource) for How to Make Your Own Hawler/Pot Lifter. Would take 15 mins and cost $3. 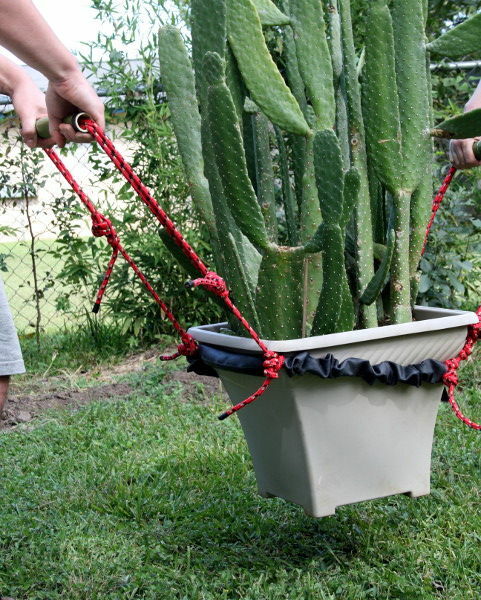 DIY potlifter at work – from the Instructibles page. some PVC pipe for handles. 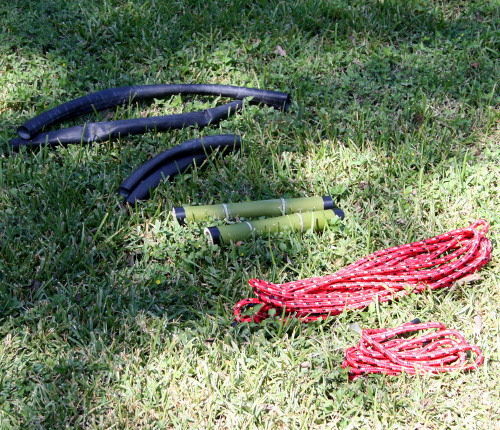 Materials for potlifter – these are from the instructions, not the ones I used although mine looked much the same. I had the rope and PVC pipe on hand but no spare inner tubes. Fortunately, I happen to live not far from a bike repair place so I wandered over and asked if they had any old punctured inner tubes lying around. You know what, they did! And they were happy for me to take them off their hands since they would otherwise just be thrown away. So we were recycling/upcycling too! Doesn’t get better than that. You do have to learn a new knot, a Blake’s Hitch, which takes a little practice but before long I had it all put together and ready to try it out. 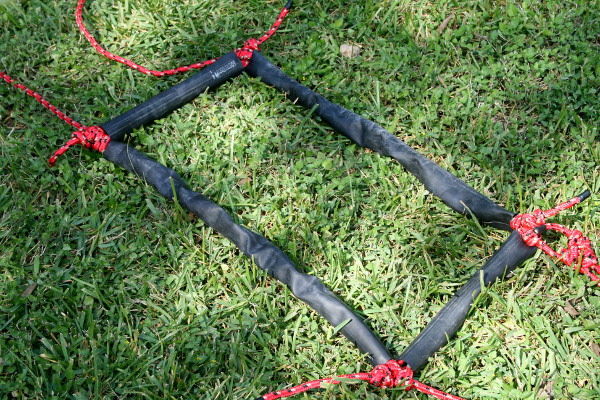 The way it works is that the inner tubes form a square through which the ropes are threaded. You put the square around the pot you want to lift, snug up the knots so that it is tight around the pot, then lift using the PVC handles. Very very clever. I admit to feeling nervous as to whether my minion would be tall enough to help, and whether it would be safe since he’s so little and I would have hated for it to fail and fall on a toe, but we figured it out and got the job done with all toes, limbs and eyes intact. And not a daddy to be seen. Whoo hoo! Very very pleased with this Instructible and the solution it provided me. With the weather warming up I’ll be able to move the pots around as I need to which is nice. The other great thing about this design is that it is adjustible, so I could use it on my lime tree pot too. Yay! How do you move heavy pots around? Have you tried a potlifter like this? Wish I could claim it to be *my* cool idea, but alas … It has worked nicely though. Would encourage anyone to give it a try. Love that you came up with a solution so you ‘weren’t dependant’ on your Hubbie – you go girl. I think the Hubster is happy too as he doesn’t have to lift the heavy pot all by himself anymore! Win-Win!